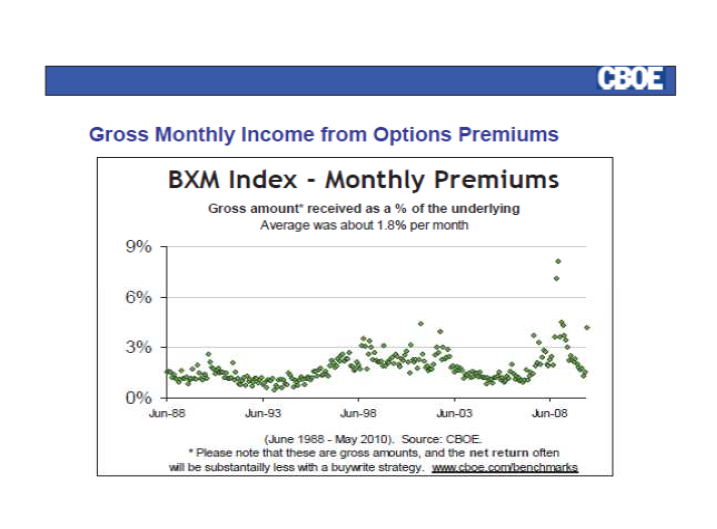 By selling a stock option contract you can generate an income, on average 1% per month (see picture below from the CBOE by Matt Moran), which can give your portfolio some protection in market declines. This will obviously not protect 100% of your portfolio but by buying a stock option (put) will insure 100% of your investment in that particular stock. The income you generate by selling options can enhance your annual portfolio returns. Stock option income will also allow you to buy more stocks which can be at better purchase price. This strategy is called dollar cost averaging. When selling a stock option, you can achieve a lower price on new or existing stocks by reducing your purchase on average by 1%. The Chicago Board of Options Exchange has made it easier for investors to trade options. Learning how to trade stock options can help you protect your portfolio, generate an income on your investments and buy stocks at lower prices.